They're the talk of the Premier league. The team pipped by the pundits to break the top four in England very soon. And we've got their stunning new Official Umbro Manchester City 09/10 Third Soccer Jersey! The white jersey with the sash is a throwback of the one they wore in the 70s, and has been described as a ‘classic remastered’. 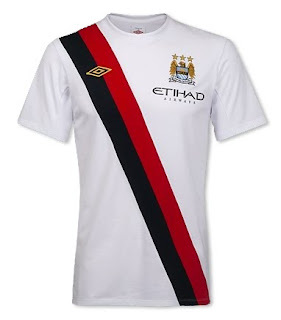 According to the kit designer, the shirt is a modern interpretation Of City’s original sash design, but with the sash moved to the other side. One of the reasons for doing this is was to draw attention to the crest, and this was done with the full support of the club and the club’s sponsor, ETIHAD. It was important that the sash did not distract from the crest but instead created a frame for the crest. For the last decade, or so, any shirt with a design across the front is compromised with a space where the sponsor sits. Well this is a pure football kit and the sponsor - whether it is a brand or a manufacturer - should look to compliment the kit. By placing the sponsor under the crest and not breaking the sash, was blended contemporary with traditional design. This goes to show that innovation isn’t always about technology. This shirt makes a statement. It stands out from the crowd - globally as well as domestically. The new shirt demonstrates that a sponsor can enhance rather than compromise a design.